From the National Oceanic and Atmospheric Administration, here is something to blow your mind (meaning, mine). The division that is Acoustics Monitoring. 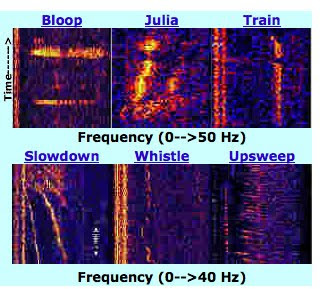 They have been recording and listening to oceanic noises since 1991 using the U.S. Navy Sound Surveillance System network and autonomous underwater hydrophones. 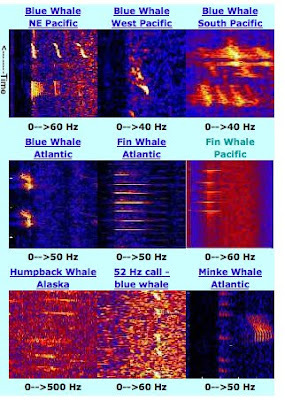 This sound was recorded May 19, 1997 on the Equatorial Pacific Ocean autonomous hydrophone array. The sound slowly descends in frequency over about 7 minutes and was of sufficient amplitude to be heard on three sensors at 95W, and 8S, 0, and 8N, at a range of nearly 2,000 km. 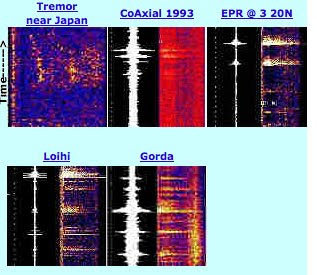 This type of signal has not been heard before or since. It yields a general location near 15oS; 115oW. The origin of the sound is unknown. 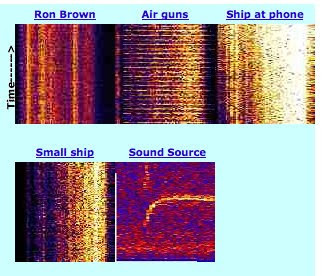 These are the spectrograms from the sounds listed. I love this! Thanks for posting this topic! Oh sure - unidentified sounds - monsters - Oh My - I'll never swim in the ocean again. Well it could be also because I live a 1000 miles from the nearest one. These are wonderful, eerie and beautiful. Thanks for the find!